If you're going to Taro and on the lookout for somewhere to stay, you'll have a nice selection of options to choose from. Pick any of the 7 within 5 kilometres of the city centre. You won't be too far away from the action at the Elephant Safari Park Lodge and Puri Gangga Resort. A good area to check out is Kemenuh. Kemenuh is 15 kilometres from the centre of Taro and has 9 places to base yourself. Hotel options in Kemenuh include the Villa Puri Darma Agung and Anusara Luxury Villas - Adults Only. Also popular with tourists is Penestanan, an alternative Taro hotel neighbourhood 16 kilometres from Taro's heart. 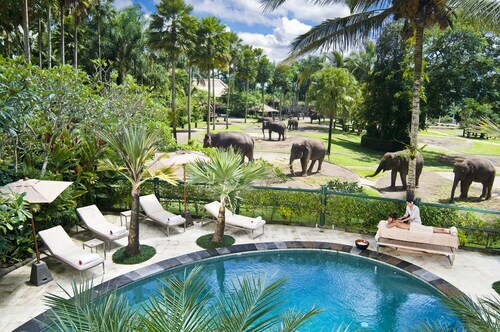 The Sungu Resort & Spa and Villa Nirvana are some of the 13 places to stay in Penestanan. Tirta Empul Temple is a must-visit for those looking to learn about the roots of local culture. Puri Sebatu Resort and Padma Resort Ubud are excellent options if you're looking to be in the vicinity of this attraction. Take a trip to Elephant Safari Park, where they work to promote the happiness and safety of the animals that reside there. Rest your head at Saudara Home and Pondok Sebatu Villa and you can stop by this hotspot as much as you like. If you find yourself searching for more accommodation options in Taro, look into the Alila Villas Soori and the Viceroy Bali. They are located 35 kilometres and 14 kilometres away from the city's main streets. 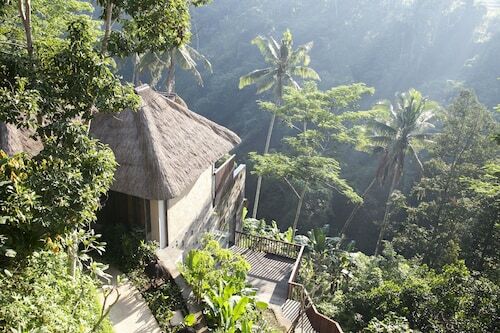 Wotif also recommends the Four Seasons Resort Bali at Sayan and the Chedi Club Tanah Gajah, Ubud. The first is 16 kilometres away from the center, while the other is 17 kilometres away. The close by cities of Pelaga and Carangsari are definitely worth going to. Pelaga is 11 kilometres to the northwest of Taro, while Carangsari is 12 kilometres to the southwest. Pelaga hotels include the Bagus Agro Pelaga and Royal Tulip Saranam Resort and Spa. Carangsari choices are the COMO Shambhala Estate and Villa Amrita. Ngurah Rai International Airport is the most logical airport for accessing Taro and is 45 kilometres drive from the centre of town. 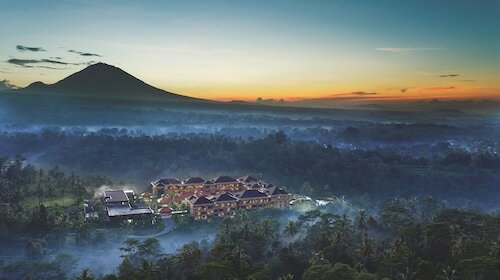 If you choose to stay nearby, try the Four Seasons Resort Bali at Jimbaran Bay or the Temple Hill Residence Villa. How Much is a Hotel Room in Taro? Hotels in Taro start at AU$177 per night. Prices and availability subject to change. Additional terms may apply.